The ID1050x is the evolution of the ID1000, and the latest addition to the X-Series. 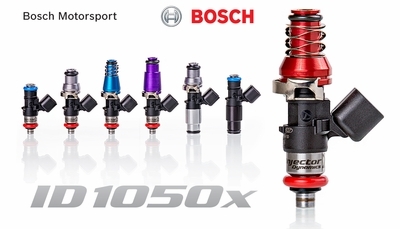 The ID1050x injectors supercede and replace the original ID1000 injectors. It is the most recent offering from the partnership of Injector Dynamics and Bosch Motorsport, and is the result of lessons learned during development of the ID1300x, and ID1700x. Compared to the original ID1000, the ID1050x offers numerous improvements, and is sure to become the new reference. Corrosion resistant internals make it compatible with all known fuels, capable of extended service life with corrosive fuels. Improved internal flow path increases output by 5% without sacrificing low flow performance. Stronger magnetic circuit offers stable operation up to 10 bar. Replaceable inlet filter extends service life. "OBD2 Pnp Adapters" option - the injectors will be shipped with a set of 4 plug-and-play adapters that will allow you to plug in your factory OBD2 style/ K series injector connectors to the adapters, then the adapters will plug directly into the new injectors. Use this option if you do NOT want to cut or splice into your engine harness.